While the collected world of technology scampers around trying to pull details on Windows Phone 7 out of the ground, a few teenagers have beaten the odds and secured samples of the upcoming phones. And best of all, their process of acquiring the phones was kosher: they were gifts right from Redmond. 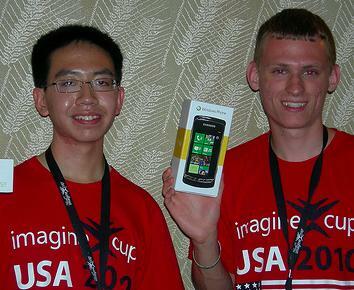 Eric Lo, 16, and Christian Hood, 17, recently won Microsoft’s Rockstar Challenge, by hacking a Wiimote to build an application for Windows Phone 7 called Droid Challenge. Impressive for two guys who are still so young. The duo received, more than free trips to the awards ceremony in Poland and some serious prize money, two Windows Phone 7s. It turns out that all finalists get the phones as well, which will put several hundred of the gadgets into the common market. Microsoft is doing itself a solid by involving developers around the world of all stripes in their upcoming phone project, they are going to need as many coders from day one to launch their new platform as they can get. For Eric and Christian, it seems that a lifetime of employment is in their futures.